By KC Aiken, D.D.S., Inc. Watching your newborn develop into a toddler, then an elementary schooler, a teenager, and finally an adult is one of the most exciting and rewarding experiences there is. Throughout the years, you’ll note the passing of many physical milestones — including changes that involve the coming and going of primary and permanent teeth. Here are some answers to frequently asked questions about children’s dental development. When will I see my baby’s first tooth come in? The two lower front teeth usually erupt (emerge from the gums) together, between the ages of 6 and 10 months. But your baby’s teeth may come earlier or later. Some babies are even born with teeth! You will know the first tooth is about to come in if you see signs of teething, such as irritability and a lot of drooling. The last of the 20 baby teeth to come in are the 2-year molars, so named for the age at which they erupt. When do kids start to lose their baby teeth? Baby teeth are generally lost in the same order in which they appeared, starting with the lower front teeth around age 6. Children will continue to lose their primary teeth until around age 12. What makes baby teeth fall out? Pressure from the emerging permanent tooth below the gum will cause the roots of the baby tooth to break down or “resorb” little by little. As more of the root structure disappears, the primary tooth loses its anchorage in the jawbone and falls out. When will I know if my child needs braces? 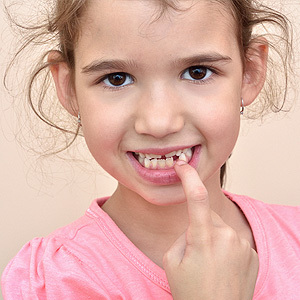 Bite problems (malocclusions) usually become apparent when a child has a mixture of primary and permanent teeth, around age 6-8. Certain malocclusions are easier to treat while a child’s jaw is still growing, before puberty is reached. Using appliances designed for this purpose, orthodontists can actually influence the growth and development of a child’s jaw — to make more room for crowded teeth, for example. We can discuss interceptive orthodontics more fully with you at your child’s next appointment. When do wisdom teeth come in and why do they cause problems? Wisdom teeth (also called third molars) usually come in between the ages of 17 and 25. By that time, there may not be enough room in the jaw to accommodate them — or they may be positioned to come in at an angle instead of vertically. Either of these situations can cause them to push against the roots of a neighboring tooth and become trapped beneath the gum, which is known as impaction. An impacted wisdom tooth may lead to an infection or damage to adjacent healthy teeth. That it is why it is important for developing wisdom teeth to be monitored regularly at the dental office. Saliva probably doesn’t rate high on your amazement meter. You’re more likely to notice its absence and the dry irritation that results. But you might be more impressed with this unsung bodily fluid if you knew all the things it does. It’s definitely a multi-tasker, performing a number of jobs (including aiding in digestion) that not only keep your oral health on track, but your general well-being too. 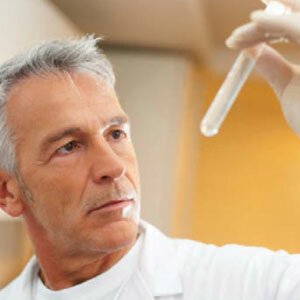 And there are even new testing methods where saliva may even tell us when you’re not doing so well. Here are 3 more tasks your saliva is doing for your mouth right now that truly makes it amazing. Cleansing. Your teeth’s chewing action shreds food so it’s easier to digest. But that also leaves behind tiny particles in your mouth. Bacteria feast on these particles (especially carbohydrates like sugar) and produce acid as a byproduct, which can increase your risk of tooth decay. Saliva serves as a kind of “rinse cycle” for your mouth, helping to wash a good bit of these errant particles down your throat and away from hungry bacteria. Defense. Speaking of bacteria, your mouth is home to millions of them. While most are harmless or even beneficial, a fraction can harm your teeth and gums. Saliva is your first line of defense, emitting an antibody known as Immunoglobulin A that targets these bacteria. Saliva also produces an antibacterial substance called lyzozyme that prevents bacteria from growing. Enamel Protection. Although it’s the strongest substance in the body, your teeth’s enamel can’t withstand the effects of mouth acid, the by-product of bacterial feeding and growth. Acid levels naturally rise after eating; but even this sudden rise can begin the process of demineralization where minerals in enamel dissolve. Saliva saves the day by first neutralizing the acid and restoring the mouth’s normal pH in about thirty minutes to an hour. It also helps restore minerals in enamel, a process called remineralization. It’s all in a day’s work for this remarkable fluid. In 1978, Dr. Aiken returned to Hudson, Ohio and opened his own practice. Since then, Dr. Kevin C. Aiken, D.D.S., Inc. has grown into the established dental practice that it is today.